Last week, I ran through Thursday, walked Friday and didn’t run all weekend. On top of that, I eat like a king (not a good king) for the second weekend in a row. I think it’s the summer heat that has gotten to me. That and a very busy schedule that seems to be getting busier. The bad part of my dumb thing is that I have gained weight. More then I think I should have, but considering 2 weekends of eating frenzies, I guess I understand why. I’m not too concerned as when I get back out and run, I can loose the extra weight pretty fast. However, I really should have been more self controlled this weekend. Saturday I was out with my family shopping this weekend and ended up in a bike shop. I had a great sales guy just try to give me some biking basics and help me price out a bike. Wow, biking is so much more expensive then running. For a basic bike and all the stuff that I’d have to buy to go with it, I was looking beyond $1,000. Fortunately my old running buddy @BigBigGeek is now an avid cyclist and he things he can get me going on an older bike my sister left to me for a lot less. I hope that works out. I’d like to add biking into my routine, but I honestly don’t want to spend $1,000 until I know I want to go that route. Back to my weight. I did another stupid thing. I skipped my apple cider vinegar (ACV) yesterday. I was just too busy and decided mot to drink it. I paid for that today and I was back on the ACV train this morning. About ACV, I know now that it really helps my workouts. I run in the afternoon and in the summer, it gets HOT outside. I forgot to take my ACV twice last week before my run and I was spent after 2 miles. I basically had to run/walk most of the rest of my route. 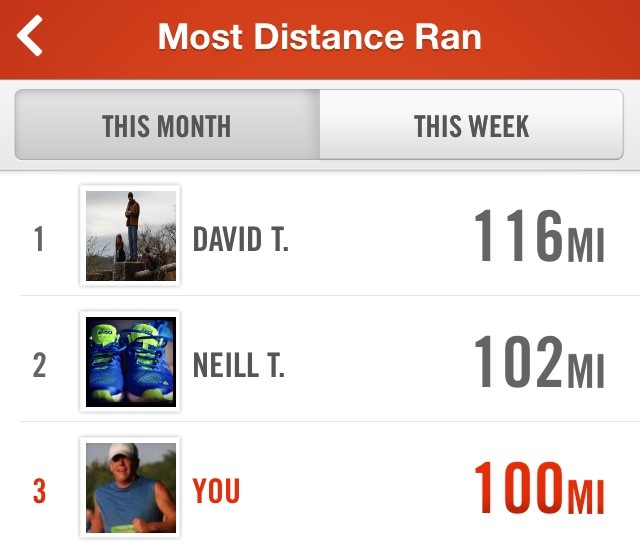 Then Thursday I remembered it and had a much more consistent run. I wasn’t setting any records, but I only stopped twice. I can really tell the difference. It must have a property that I need or that helps endurance in the heat. Either way, I am still hooked on the stuff. I just wish someone could make it taste better!!! That is about all for me for today. I hope everyone had a great weekend! It was way too short for me, but I guess that means I got a lot done! 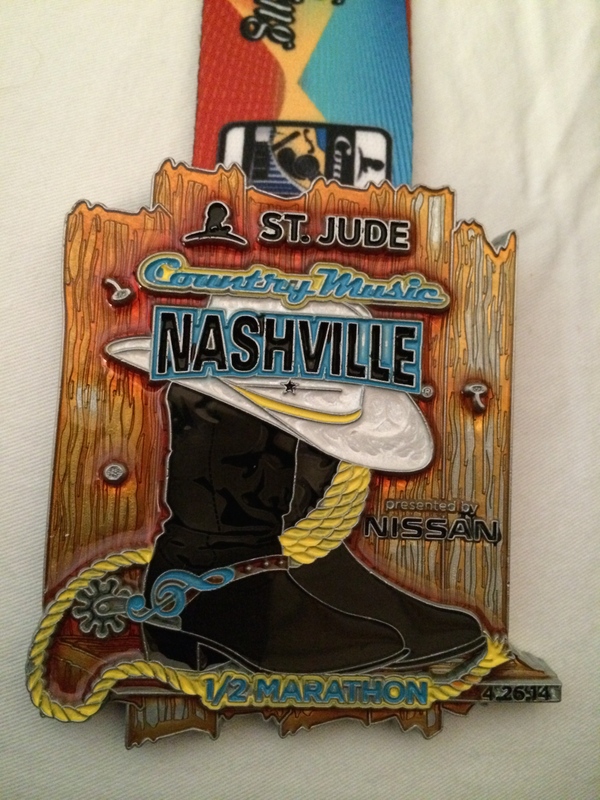 Country Music Half Marathon – PR and Recap! So, how’d it go? The race? 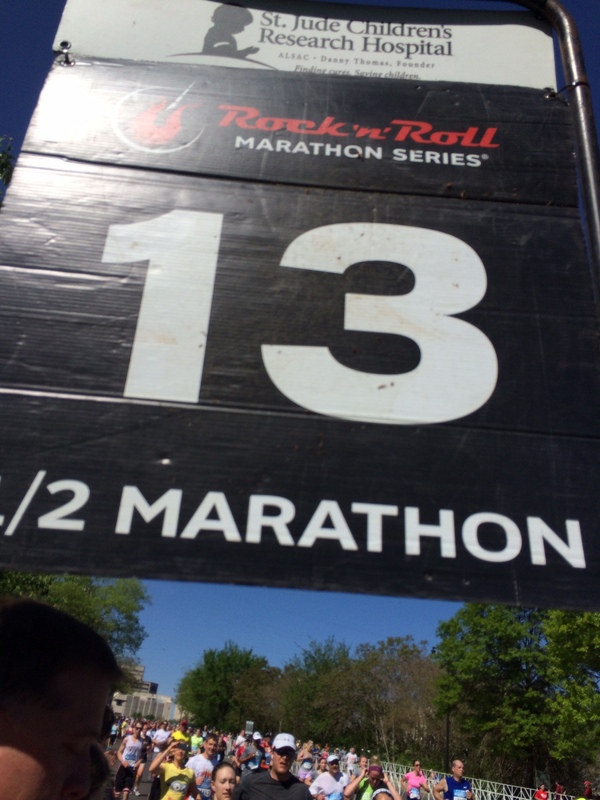 My second half marathon? 1:43:03 – a PR by 1:08 minutes. Honestly, I wouldn’t have made it without TJ pacing me. The last 1.5 miles were mostly up hill. That, after a lot of hills in the first 8 miles and trying to keep below an 8:00 pace… Which I did for all but the first mile. My phone said I ran 13.33 miles rather then 13.1, so the times are a little off. Philosophically, I view racing as similar to childbirth (please don’t get offended with me ladies). The fact is – it hurts while you are in progress, but after it is over, you can barely remember the pain. It was a beautiful morning. We got to our reserved parking area in pretty good timing. We met @BigBigGeek and @David_Topping and talked for a bit. Then to the porta-potties for an hour wait – that was crazy. TJ and I rushed off to coral #3 and left RS and the others to finish their business. By the time we got done with the port-potties, it was just 10 minutes until race time. We in just a few minutes the corals began moving. When we got to the starting line, somehow we were in coral #4 rather then #3. I don’t know how that happened, but the 3:30 marathon pacer was also in our coral, which ended up being a very good thing. 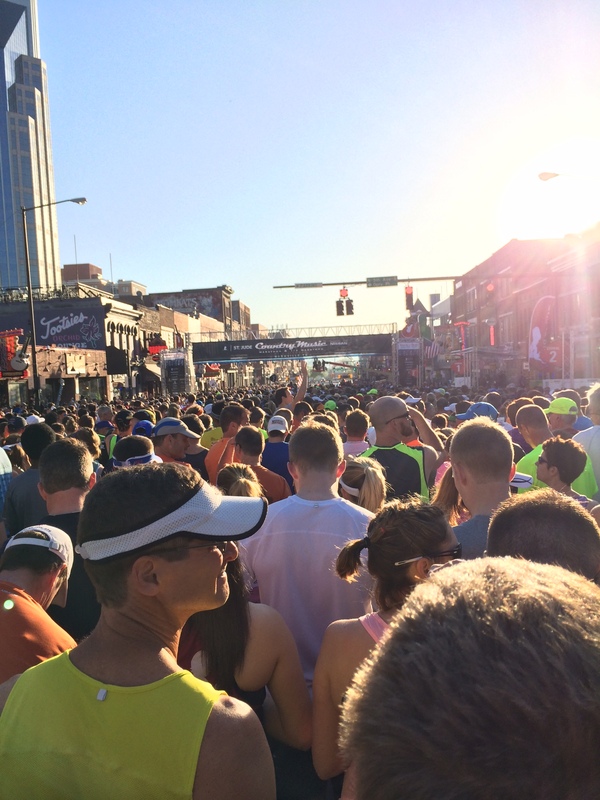 I have never run a race with 20,000 people in it. Actually I think the half marathon had 20,000; I’m not sure about the total with the marathoners. We heard the horn and began our run. It was tight. It was hard to run freely for at least a few miles. The first mile was our slowest at just over an 8:00 mile (which really wasn’t bad). That was mainly due to congestion. Shortly after mile one, we ended back running past the corals with people standing and waiting to run. I guess there were near 30 corals. I thought of RS who was around coral 22. We were 30 minutes into running before he even began. TJ helped me make an unofficial goal to keep the 3:30 marathon pacer in sight as we never saw the 1:45 half pacer after the start. This was hard for the first 3 or 4 miles. He would get a bit ahead and we would slowly catch up. The crowds were just too deep to get around. I would see an open area and do a quick sprint to get ahead (the one thing TJ said was a mistake after it was done – he said we should have saved that energy and been patient to get around people… good point). Finally after several miles we caught up with the pacer. We hung with him until mile 10 or so. This was huge for me. Let me digress a bit and say the hills on this route were crazy. The first 8 miles or so seemed to be one hill after another. I could feel my mountain runs kicking in after a while. 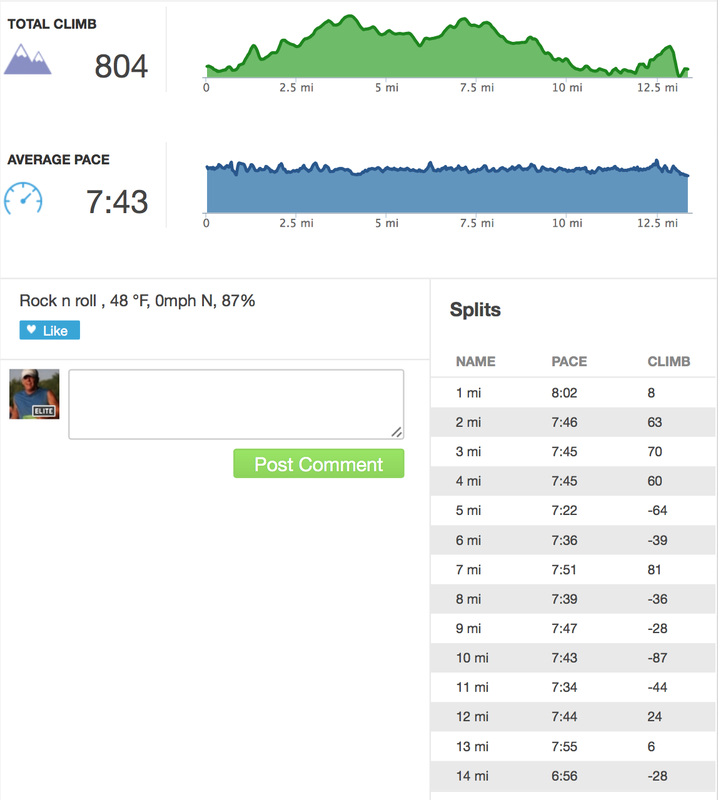 I have done quite a few mountain runs in the past few months, but never at an 8:00 pace. Though when I was running this race and I was getting tired, my legs seemed to keep their strength. I needed that! As we went up and up and up and up, my legs were good. I was tired, breathing hard and wondering why I was doing this at times, but my legs kept me going. Mile 3 TJ gave me my first GU. Mile 7 I had my second and mile 11, the course provided one. Perfect. Each time I was fading a bit, the GU kept me going. I was so glad for them. Finally the day got warm. It started in the 50’s, but by mile 8 or so, it was warming up a bit too much. This is where I first hit a small wall. I was thinking, “I don’t know that I’ll make it the next 5 miles”. This was when I had a neat experience. Generally I tune out during a race. I honestly didn’t notice much. I just concentrate on running the race. At this small wall experience, I ran past a person holding a sign that said, “The joy of the Lord is your strength”. I prayed, “Lord, that is true, so please give me some strength”. A moment later we ran past a large church with a praise band playing “Mighty to Save” by Hillsong. I love that song and after a moment listening to it as we went by, I felt rejuvenated and had run past the wall. Pretty cool. Finally at mile 9 TJ said it looked like the marathon was splitting between the full and the half. I panicked. I had kept a perfect pace with the 3:30 pacer for 9 miles and I wasn’t ready to go it without his lead. Fortunately I didn’t have to. We didn’t split. We kept following him. Then a good thing happened. At mile 10, we somehow got ahead of the pacer. I looked around because I didn’t see him and he was behind us. We never saw him again. We just kept with our pace and at mile 11 the route split and I was fine. Very cool. Finally the last two miles. I can do this. Little did I know that they would be mostly up hill. Seriously? I just ran up and down tons of hills, and now, after keeping below an 8 minute pace for 11 miles I am going to have to finish with nearly 2 miles of hills. At mile 12.5 I told TJ that I couldn’t continue. I felt like it was too much. He encouraged me saying we only have a little left to go and to try to keep my pace up so I’d beat my 1:44:11 PR. Honestly, I don’t know how I did, but I did. Without TJ there, I would have slowed down. 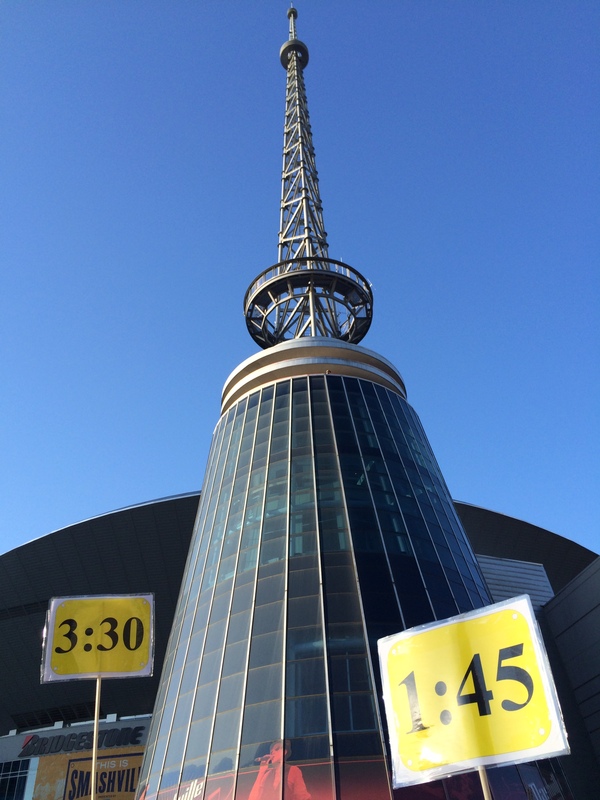 I doubt I would have walked, but I know I would have not kept up my pace. We finally began going down a hill. A runner who had finished was walking up the hill we were running down and saying, “It’s all down hill from here”. I pushed as hard as I could. A couple guys ran hard past us at the very end and TJ took off and passed them with just a few hundred of feet to go. I had nothing left. I just put everything in my body to get to the finish. Everything. Thank you all. It was well a done race. I hated the hills, but my mountain prepared me for them. Once again, without TJ I would not have come close to the time I had. Thank you TJ. 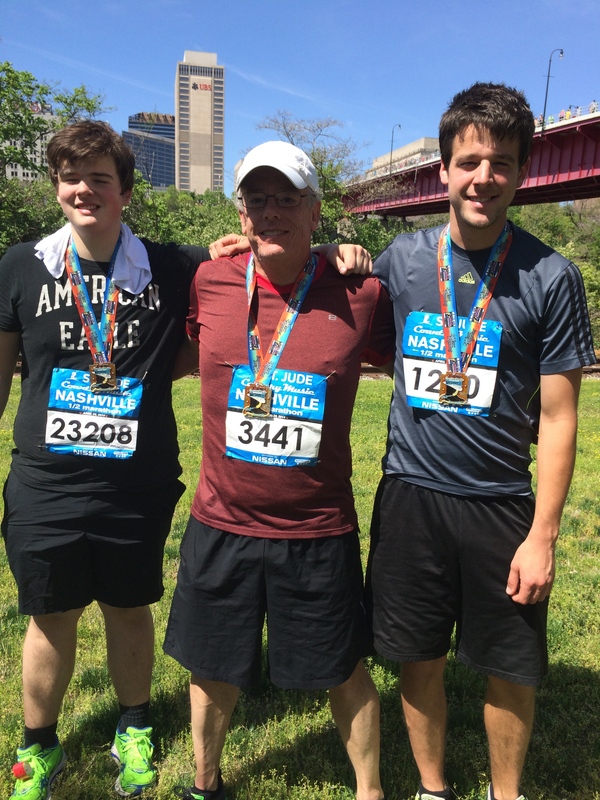 Thank you to my family for letting me spend a weekend away to run this race. Thank you to everyone who liked my “results” post. Blogging makes running so much more fun.